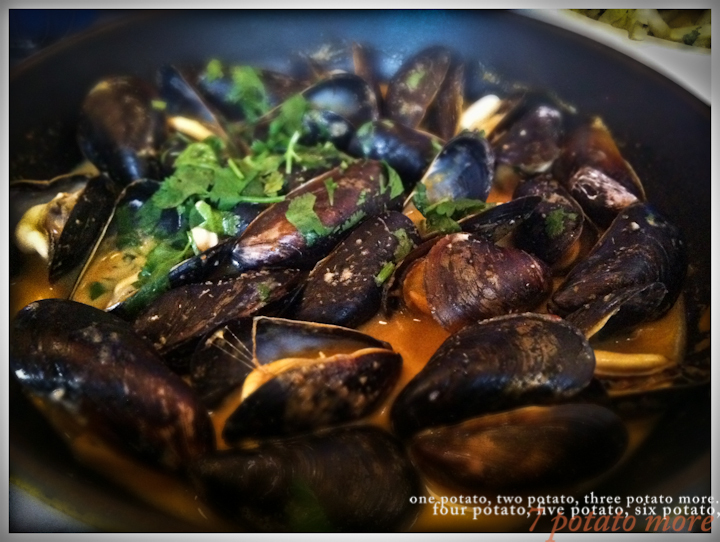 Posted by ccdc in belgian, lunch, seafood, washington d.c.
One of my favorite meals is mussels and frites. And one of my favorite mussels and frites is at Brasserie Beck. My go-to choice is the fennel and chorizo (I’ve also had the deliciously rich irwin mushroom mussels), but this time, I decided to try the spicy red Thai curry. I know it’s a cop out, but I like them all equally, just depends on what mood I’m in. 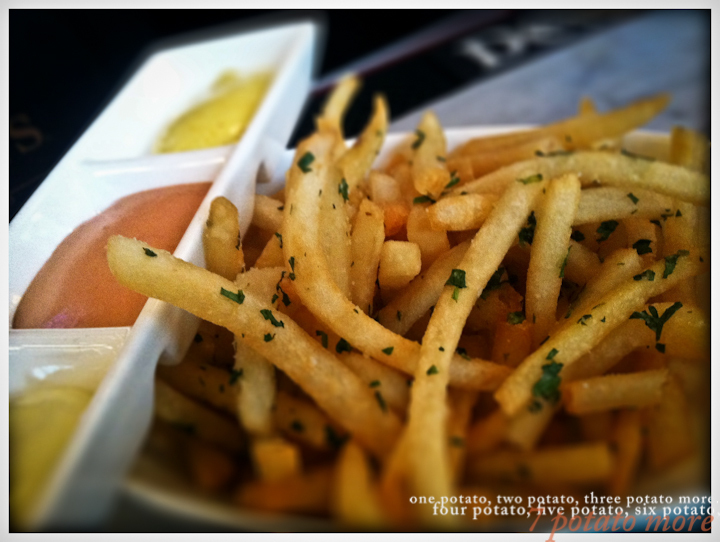 With all options, Brasserie Beck serves some of the best dipping mayos to accompany thin and crispy frites. 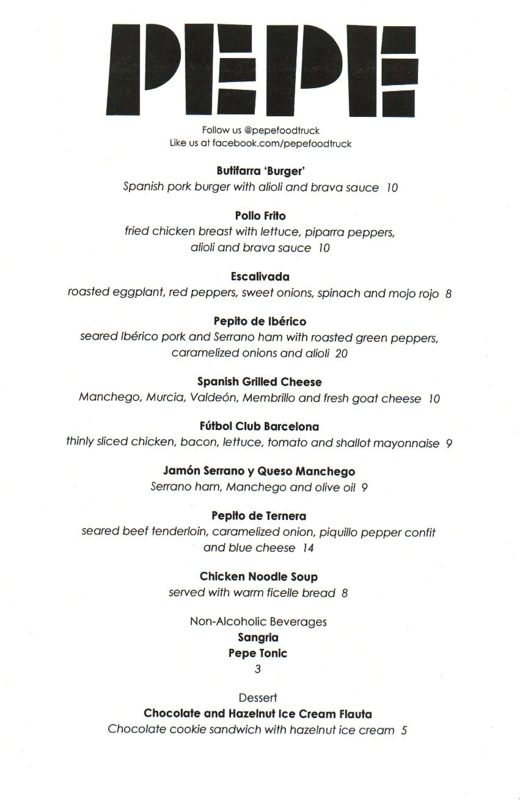 Posted by ccdc in dessert, food truck, sandwich, spanish, washington d.c.
On my wish list: the butifarra, pollo frito, pepito de iberico, futbol club barcelona, jamon serrano y queso manchego…..and chocolate and hazelnut ice cream flauta. So, yeah, pretty much the entire menu. I knew I would not walk away with just one, so it only made sense that one of my choices be dessert . 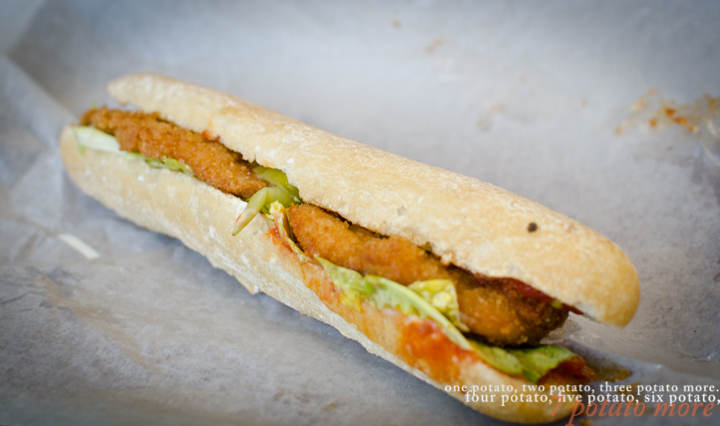 . . and while I was at it, why not get the pollo frito? Ice cream + fried chicken = awesome lunch. Since I had to order a melting dessert at the same time as I ordered my savory sandwich, I thought I needed no other excuses to eat dessert first (obviously). 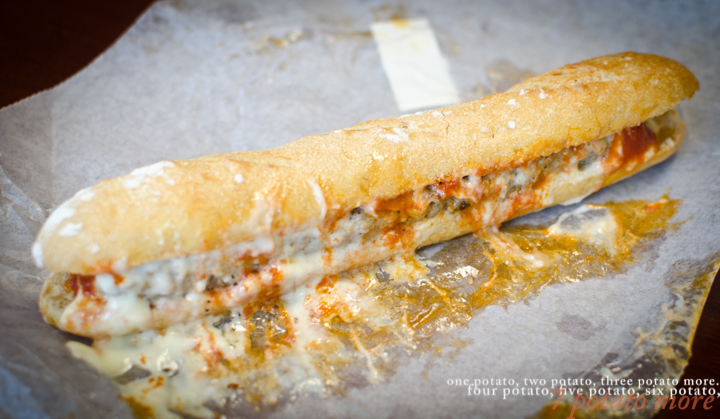 But after taking a few bites of the dessert flauta (think more like a frozen, elongated whoopie pie, rather than one of the denser toll house ice cream sandwiches), the aroma of my pollo frito flauta (I think it was the brava sauce…) overtook me. So midway through my ice cream sandwich, I switched to savory (and confirmed that food trucks can in fact serve high quality, perfectly crispy fried chicken!). 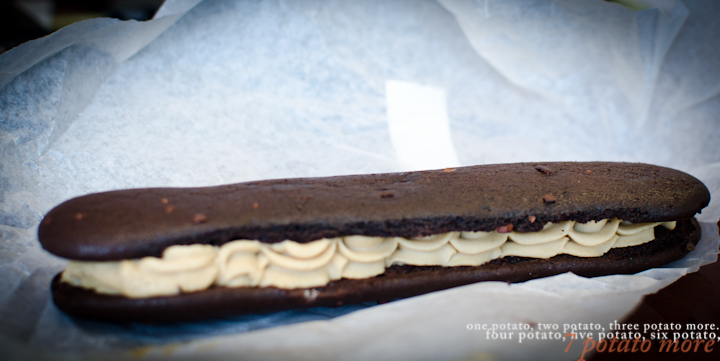 . . and then returned to my ice cream sandwich before it melted away. My co-worker H ordered the butifarra, and also really enjoyed her pick. 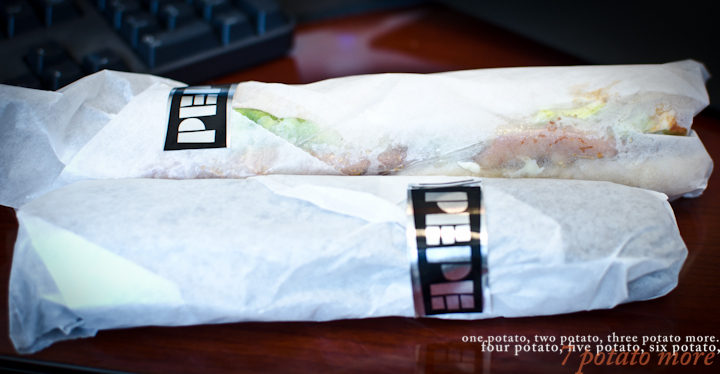 A word to the wise: when eating the sandwiches, to minimize mess and the loss of delicious morsels, it’s best to keep the sandwiches in their precisely wrapped paper with one end open, and peel down the paper as you go. Of course, the line at Pepe forms quickly, but the duration between ordering and having your named called is impressively short. Can’t wait to make my way through the rest of Pepe’s menu! 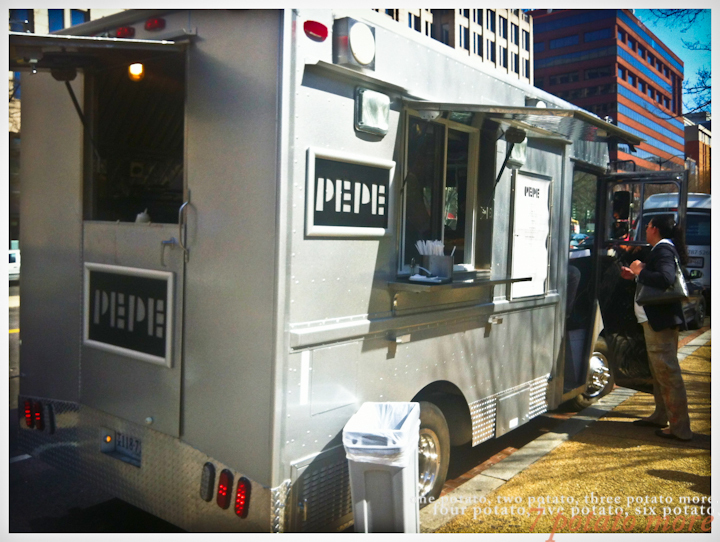 For Pepe’s location, follow Pepe on Twitter. Posted by ccdc in american, lunch, seafood, southern, washington d.c.
After happy hour at Black Jack, I was eager to return to try Pearl Dive Oyster Palace. When my friend R asked me if there were any new places we should try for her birthday brunch this past Saturday, I immediately suggested Pearl Dive. If the long lines for dinner have kept you at bay, I definitely suggest giving lunch a shot. When I arrived around 12:15, they were able to immediately seat me for 2, and there were still empty tables around us (though, the tables definitely filled up by 12:45ish). I was a tiny bit disappointed that they only had lunch on Saturday, reserving their irresistible brunch menu for Sundays. We each started with the Albalone Bellini, but don’t let the “bellini” name fool you . . . these drinks are strong! Refreshing. Delicious. But wow. 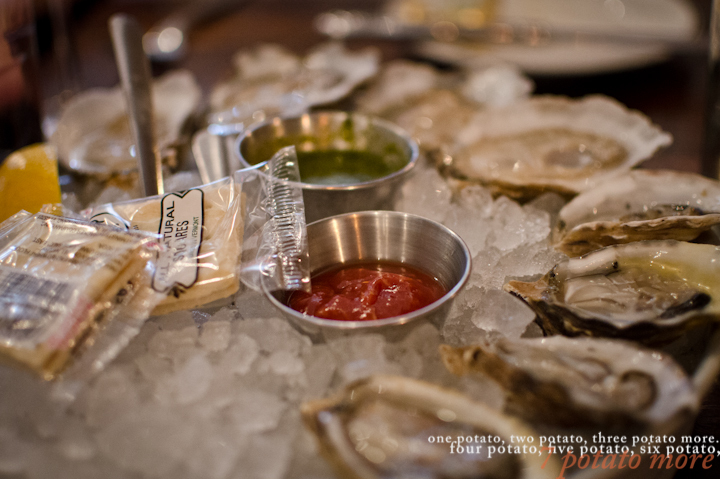 We also ordered eight oysters to start, and after I requested oysters low on brine, we were served four oysters from Virginia and four oysters from British Columbia. They were both delicious, especially with the green Dive Juice, but I think I prefer the home team from Virginia. 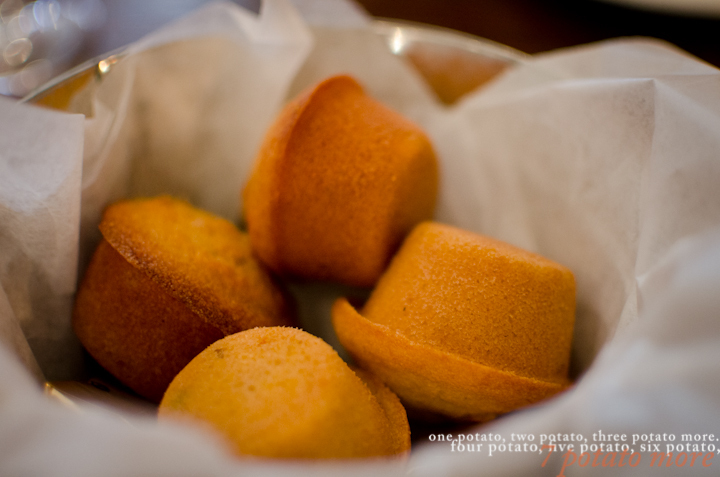 I had read online that Pearl Dive offers free cornbread muffins . . . IF requested. And since I had just finished a long run before lunch, my body was screaming, “FEED ME CARBS!,” so I requested the muffins. And I’m glad I did because they were warm and delicious. Luckily, one of the 10 items I had eyed from the brunch menu–the grilled redfish with pecan butter and stone grits–was on the lunch menu, so that was an easy decision for me. 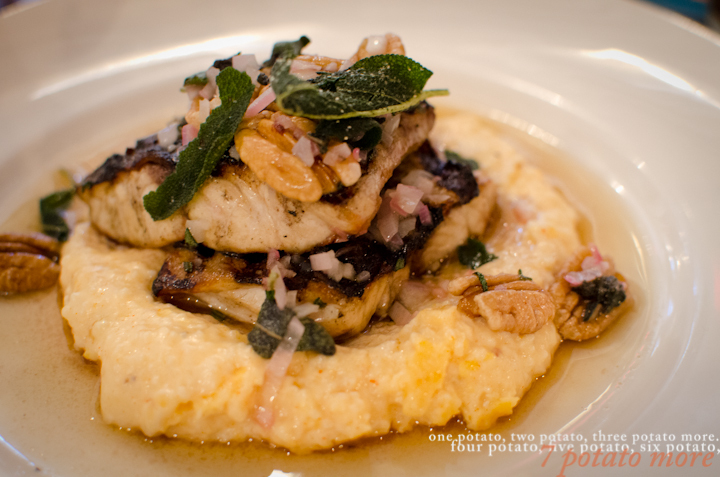 Any menu item featuring grits will always make my short list, and Pearl Dive’s fish and grits did not disappoint. Somehow it was rich and flavorful without being too “ugh”-heavy. I would definitely order it again and again. . . once I’ve crossed off the other to-tries on my list! 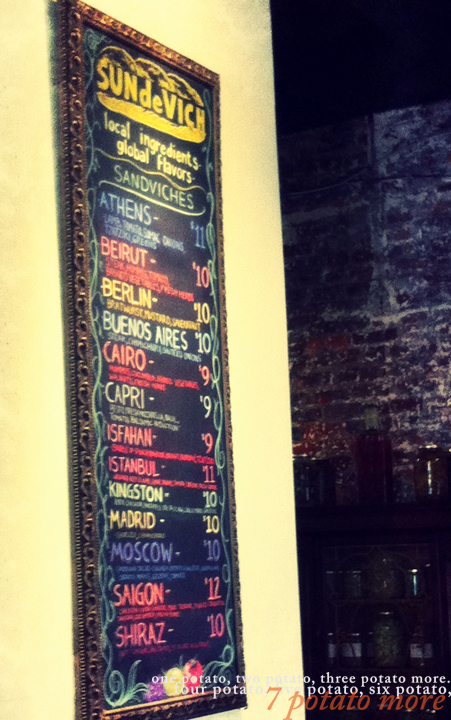 Posted by ccdc in lunch, sandwich, washington d.c.
alley, baguette, buenos aires, convention center, kingston, lunch, saigon, sandwich, shaw, sundevich, washington d.c. I love everything about SUNdeVICH. I love that it’s located in an alley (off 9th Street, between N and O Streets) in the Shaw neighborhood. I love that it is a converted garage. I love the attention to detail in every nook of the space. 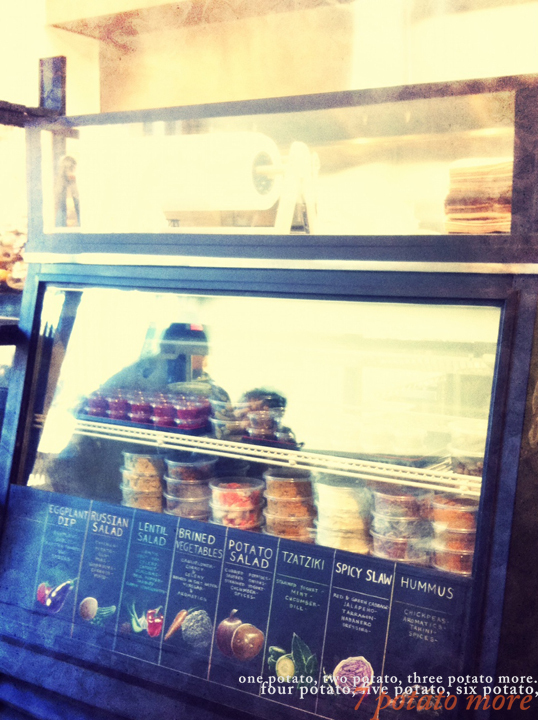 I love the handwritten menu boards. I love that its owners live in the neighborhood. I love its commitment to local ingredients and green practices. Oh, and I love the sandwiches. 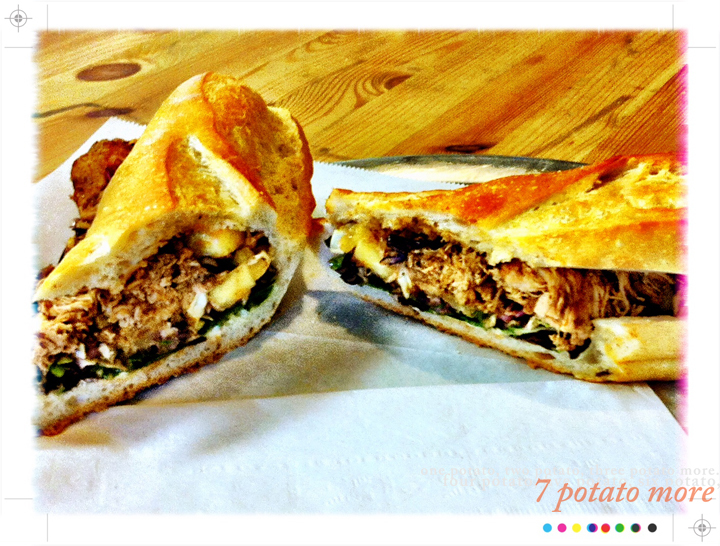 SUNdeVICH offers global-inspired sandwiches with BOLD flavors on a distinctly crusty baguette. So far, my favorite is the Kinsgton — Jamaican jerk chicken, pineapple salsa, greens, slaw, and garlic mayo. 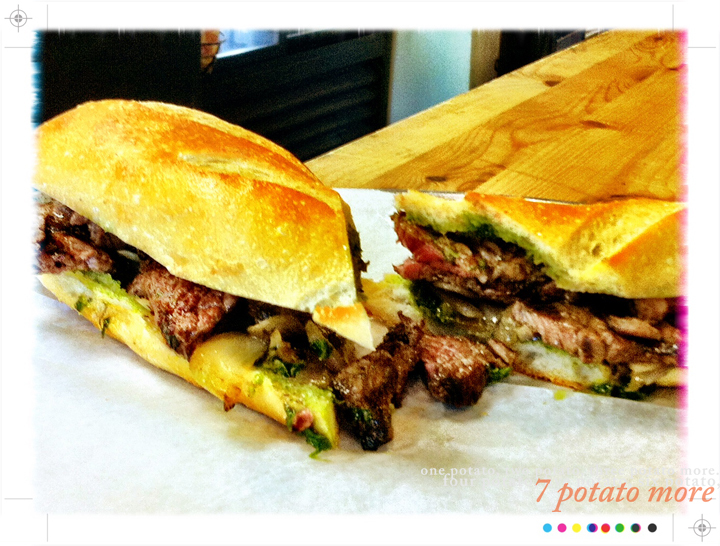 The spicy jerk spices are perfectly balanced with the sweet salsa and garlicky mayo. The Saigon is milder but also a flavorful and solid choice. The steak in the Buenos Aires is mouthwatering.